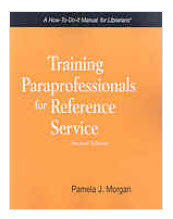 I am the author of Training Paraprofessionals for Reference Service, 2nd revised edition. Neal-Schuman Publishers, Inc. Using paraprofessionals to answer reference questions is a great way to expand your library’s reference reach while getting the most value out of your staff. But how do you begin training them? What training materials should be used? What skills should be taught? How important is the reference interview for paraprofessionals? What are the pros and cons of using paraprofessionals in this manner? I answer these and other questions in a new edition of this book. Morgan…provides a comprehensive nuts and bolts guide to integrating paraprofessionals into professional library staffs.